After 18 months of anxiety and repeated requests for news of their youngest son Ronald reported missing in Italy on May 12th, 1944, whilst in action with the Royal Fusiliers - Mr. and Mrs. W. Favell, Crown Walk, St. Ives, have been noitified that after extensive inquiries no trace can be found, and that it must reluctantly be presumed that he succumbed to his wounds. Twenty one years of age, Ronald, only a few months before was seriously wounded, and, now that tyhe news of his death must be presumed, it provides the most tragic bereavement suffered by St. Ivians during this war, for only a year ago Mr. and Mrs. Favell's eldest son, Bill, died of wounds and was brought home to be buried at St. Ives. News of this double loss will belearned throughout the town with deep sympathy, and whilst many rejoice in victory, they will also think of these sorrowing parents who have given their all. 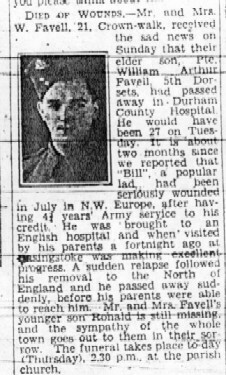 DIED OF WOUNDS - Mr. and Mrs. W. Favell, 21, Crown-walk, received the sad news on Sunday that their elder son, Pte. William Arthur Favell, 5th Dorsets, had passed away in Durham County Hospital. He would have been 27 on Tuesday. It is about two months since we reported that "Bill", a popular lad, had been seriously wounded in July in N.W. Europe, after having 4¼ years' Army service to his credit. He was brought to an English hospital and when visited a fortnight ago at Basingstoke was making excellent progress. A sudden relapse followed his removal to the North of England and he passed away suddenly, before his parents were able to reach him. Mr. and Mrs. favell's younger son Ronal is still missing, and the sympathy of the whole town goes out to them in their sorrow. The funeral takes place today (Thursday), 2.30 p.m., at the parish church. Mrs. Favell, 42, Gt. Farthing Close, St. Ives, received news on Saturday that her elder son, Pte. Walter Favell, of an infantry Regiment, was killed in North Africa last month. Thirty four years of age, Pte. Favell worked for some time for the St. Ives Gas Co. and later for Messrs. Keith Wright, Fenstanton. A territorial he was recalled on the outbreak of war and was later evacuated from Dunkirk. His brother Charlie, has been missing in Malaya for nearly twelve months.